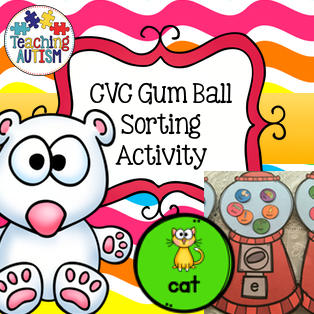 One of my most favourite resources is the CVC Gum Ball Sorting Activity. 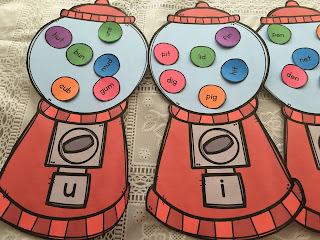 The main idea behind making this resource was that I wanted to be able to make practising CVC words more fun. When I stumbled upon the gum ball clipart set I just knew I had to have it - and up came the CVC game. The students had so much fun matching the gum balls into the gum ball machine. We all know that the best way for children to learn, is if they don't even know they're learning! They had so much fun and they were so engaged that the activity went extremely well. I've attached some photos below so that you can see the activity in action. The activity comes in two difficulty levels: image & word and just word. I recommend that you use the level you feel is more appropriate for your students individual needs and what they are able to work with. The above photographs are of the harder ability gum balls. The gum balls just have the words - no accompanying image. Students simply match the words into the correct gum ball machine. The whole idea behind the matching is that students are able to match the medial sound. The photographs above are of the lower ability gum balls. They include images accompanied with the matching word. Students simply match the gum balls into the correct gum ball machines: matching the medial sound. I highly recommend laminating each of the individual pieces of this resource so that they can be stored and re-used over and over again in the future. This is especially great for those quick time filler sessions - or even as some group games. I have attached some instructions on how this resource could be used as part of a group game session. Each medial sound comes with 6 accompanying 'gum ball' pieces. This game will work with a group of up to 6 students. 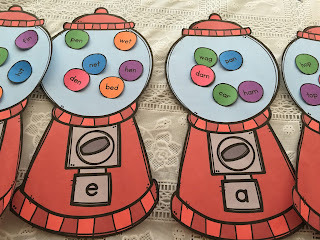 Hand out one of each medial sound to the individual students (give more to the students if you have a smaller group), then have the gum ball machines out ready. Now, you can either have a dice which students roll - put a medial sound on each side of the dice (a,e,i,o,u). Whatever letter the dice lands on - the students have to match their gum ball pieces to that gum ball machine. 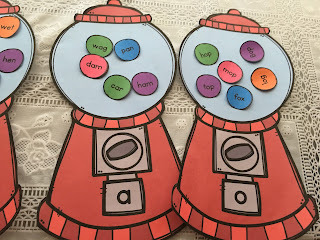 You choose a gum ball machine and offer it around to the students asking them to put their matching gum ball piece into the gum ball machine. Don't forget to click the images to link back to find this resource on my TpT!